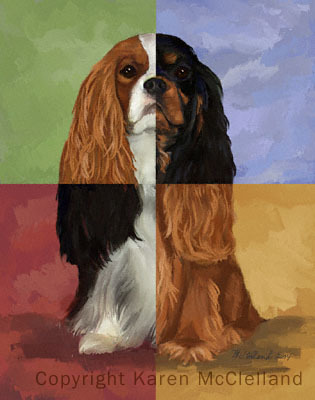 Cavalier King Charles Spaniel limited edition art print, dog painting done by artist Karen McClelland titled "Ruby Still Life"
Cavalier King Charles dog print titled "The Musketeer"
"One for All, and All in One" which is my twist on the famous king's body guards -- The Musketeers. Other Cavalier prints. Please note this edition is sold out. But, this edition was so popular that I'm thinking of doing new painting with the same concept.